When it comes to fuel-sipping mid-size sedans, the new 2014 Honda Accord Hybrid may be the top dog. Honda has just unveiled its first official images of the highly-anticipated Accord Hybrid. And if the Japanese automaker’s predictions are right, it could be the most fuel-stingy mid-size sedan in America. The numbers have not been certified by the EPA, but Honda’s initial estimates tell us the new Accord Hybrid will be at the top of the fuel mileage list. Just how good will it be? Honda is “anticipating” the new 2014 Accord Hybrid will get best-in-class-leading mid-size sedan fuel mileage of 49/45/47 mpg city/highway/combined. The numbers will still need to be verified by the EPA, but if the projected fuel mileage is accurate, the new Accord Hybrid will be at the top. The hybrid variant will join the already diverse lineup that includes the four-cylinder and V-6 powered Accord Sedan, sporty Accord Coupe and the advanced Accord Plug-In. The 2014 Honda Accord Hybrid will be the first Honda hybrid vehicle assembled in the new Marysville, Ohio plant and the second built in the U.S. The new Accord Hybrid will achieve these fuel mileage numbers with Honda's new two-motor hybrid powertrain. The system has been adapted from the Accord Plug-in that went on sale in January. It will feature a “Sport Hybrid” Intelligent Multi Mode Drive powertrain that uses three different driving modes, EV Drive, Hybrid Drive and Engine Drive to optimize fuel efficiency. How does the system work? A lithium-ion battery is used In 'EV Drive' to run in electric-only mode at lower speeds and in medium to high speed cruising. 'Engine Drive' sends the engine power directly to the front wheels, and In 'Hybrid Drive,' the 124-kilowatt (kW) electric motor and the all-new 2.0-liter DOHC i-VTEC Atkinson-cycle 4-cylinder engine cooperates together to provide acceleration and also efficient driving in stop-and-go traffic situations. Inside, the Accord Hybrid's cabin will be well-appointed and provide an “intuitive layout” that provides the driver with instant fuel economy and energy flow information for the best driving performance. Outside, the new mid-size sedan Hybrid features the same exterior styling that’s found on the Accord Sedan. In addition, it will get unique hybrid badging and a blue-accented grille and light lenses, LED daytime running lights, a unique wheel design and a decklid spoiler to set it apart from the other Accord models. 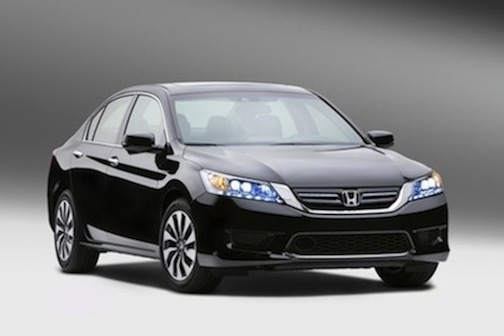 Look for the new 2014 Honda Accord Hybrid to go on-sale nationwide in October 2013. Honda keeps expanding the Accord lineup and this one will feature class-leading mpg ratings and exclusive styling. Consumers can go to the Honda Accord Hybrid site for more information and see the first official images.